An ion is an electrically charged atom. Copper/silver ionization is the electrical release of copper and silver ions. The Mineral Pure units with a copper/silver alloy mix produce non-stop ions and releases copper ions that help kill algae and silver ions that help kill bacteria and viruses. How do I know if ionization is taking place? Every ionizer features indicator lights or LCD displays that let you know ionization is taking place. Every unit also comes with an ion test kit that should be tested weekly. This indicates the unit is producing copper and silver ions. It is very simple to use and only takes a few minutes. What other testing is required with the ionizer? Normal testing of the pH and total alkalinity should be done on a regular basis. The most important is the pH. This should always be kept between 7.2 and 7.8, with preference on the lower end. The electrodes are self-sacrificing and will eventually wear out. A new set of electrodes will be required and is simply screwed in place and the old set discarded. The reagents for the test kit should be replaced every year. Your dealer has both electrodes and test kits in stock. How long will the electrodes last? The actual life-span of the electrodes depends on many factors - the size of the pool or body of water being ionized and water temperature being the main factors. Naturally, a swimming pool of 40,000 gallons will use up the electrodes about 4 times faster than a pool with 10,000 gallons. The warmer the water, the higher the ionizer will have to be set at, as more algae will grow in warmer water. The same can be said of chlorine. Your authorized dealer has been factory-trained to install the system. For a plumber, this is a very basic install. An installation manual is included with every unit. No special tools are required. What is the actual electrical consumption? Depending on how long the system runs each day and the size of the unit, the actual amount can vary. However, a regular household unit running 8 hours a day only uses about $3 a year in electricity. What is my payback period on this product? It all depends on how much you spend on chemicals. Perhaps this quick chart will give you an answer ... just fill in the numbers on the chart here to the right! In most cases, some kind of an oxidizer is required, especially in warm water areas. The ionizer will kill algae, bacteria and viruses, but it will not oxidize or burn off the debris that gets in water. 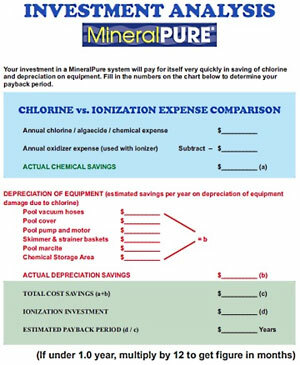 Residential applications can use a non-chlorine shock like potassium monopersulfate or even a corona-discharge ozone generator instead of chlorine, while most commercial applications will require a small free-chlorine residual at all times - still saving up to 80% on chlorine expenses. Absolutely! As you can see from the above excerpt from EPA's Quality Criteria for Water, copper is actually required in our bodies, and silver is used worldwide in many applications (see History of Copper /Silver Ionization on page 3). Silver is used by dentists, in water purification equipment, tableware, coins and in many other applications. You can't say that about chlorine! Is Mineral Pure similar to the salt system my neighbor has- they don�t use chlorine either? Not true at all. They are swimming in pure chlorine and in salt water, too. The salt they add to the pool makes chlorine - right on the premises. Their equipment will also corrode rapidly due to the salt water, incurring expensive maintenance calls.